On the golden shores of Playa D’en Bossa, Sands Ibiza – another successful venture from Ibiza entrepreneur and long-time island resident Jason Bull, in collaboration with legendary DJ Carl Cox – is buzzing with true Balearic spirit. 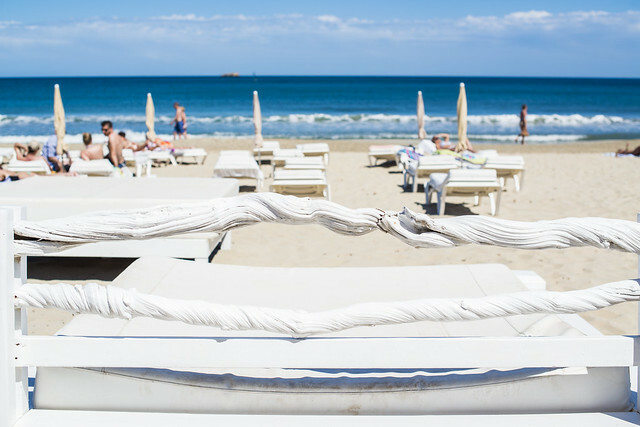 In 2014, Sands migrated just a little further south along Playa d’en Bossa, now occupying the space formerly known as Sirocco, but keeping its signature style of rustic wicker chairs, wooden floorboards and all-white day beds. This friendly, vibrant and inviting atmosphere means you can sunbathe in style alongside colourful characters or dine between Ibiza identities and tipped off travelers alike – whether a chilled out day on the beach, long lazy lunch or pre-party cocktails.